Stephen S. Roach of Morgan Stanley has come out with a report suggesting China’s only way out of U.S. consumption based growth is producing their own consumer society. Here’s a rundown of the key points. China has no choice but to abandon the growth model driven by U.S. consumption which has been in place as U.S. deleveraging will crush export demand. China will have to respond with a new five-year plan, centered on the construction of a services economy, based upon the Chinese consumer. This services economy will have to make up a massive consumer spending gap if it is going to fill the void left by the declining growth of the U.S. consumer that has propelled China’s development. China could choose to move to make itself more competitive, but those very moves could lead to protectionist responses from Western governments, eliminating their benefits. Moves will be made on three fronts to spur domestic demand, including aid to rural areas, creating a new services economy, and the creation of a stronger social safety net. All of these, in concert, will push Chinese citizens to spend. 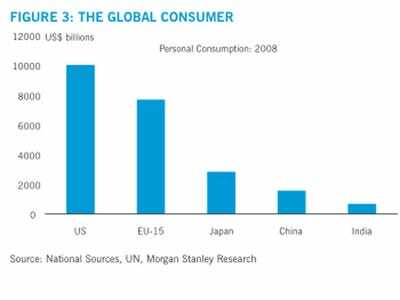 There is quite a consumption gap to be made up.